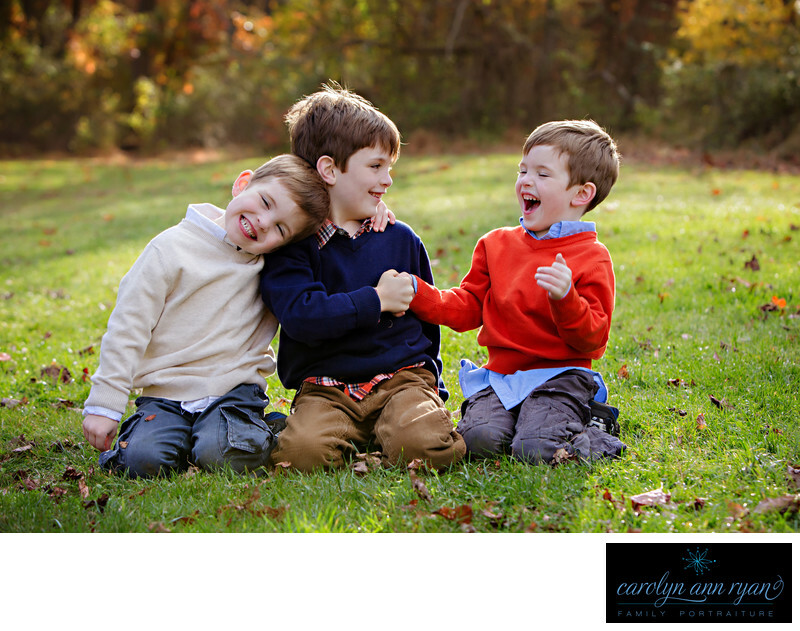 It isn't often that a thumb-wrestling match breaks out in the middle of a family portrait session! I remember thumb wrestling with my sister all the time when we were children, and I always lost, because her fingers were always longer than mine and she used her sneak attack to pin my thumb down. And so it seems, the older sibling wins here too. But there is so much to love about this photograph. The preppy sweaters and beautiful fall color coordination on each of the boys that perfect matched the colors and the Autumn sunset, but the expressions are my favorite. I want my family portrait sessions to be relaxed and stress free and an opportunity to capture the true personalities of my clients, and I think this photo demonstrates success for this family. Some Moms might have been mad at their children for not cooperating, sitting still and staring at the camera, but my clients know to just take it all in, breathe deep and let the kids act like kids. Your children will behave like children during your portrait session, and when they do, we can photograph the best and happiest of their childhood moments, sibling rivalry and all. Keywords: boys (120), Brothers (63), Brothers and Sisters (60), Family (171), Family Portraits (159), Navy (51), orange (18), plaid (105), Sibling Portraits (63), Siblings (69), Sisters (63), sweater (60), sweaters (57). 1/250; f/5.0; ISO 250; 85.0 mm.